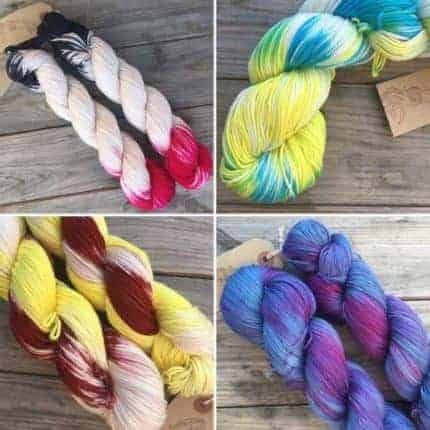 For vegan yarn lovers and for those who just like cotton, we have a selection of DK and sock weight pima cotton in a range of bright colourways. 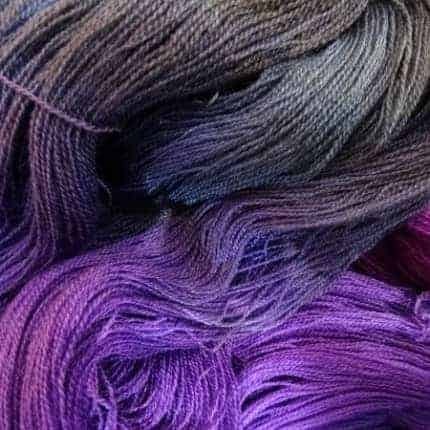 This yarn is so soft and smooth with a pretty sheen that’s it’s a visual and tactile feast to create with. Everyone’s crazy for miniskeins, and so are we! 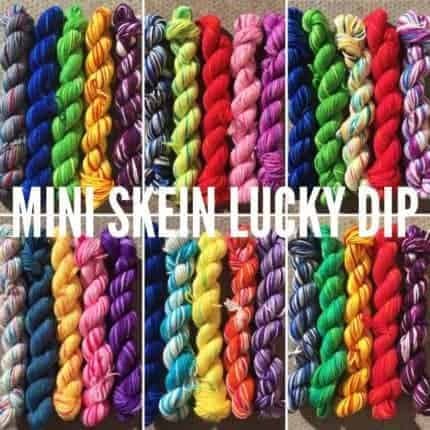 So much so that Mothy and the Squid are now offering “random” lucky dip mini skein mixes. Each is a set of ten 10g miniskeins on either platinum sock or extrafine merino DK. 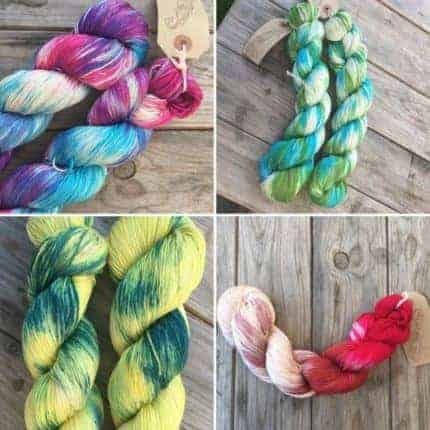 There are variegated, speckled, tonal, colour pop and rainbow colourways included, and each set has a great range of bright colours that cover the whole spectrum. 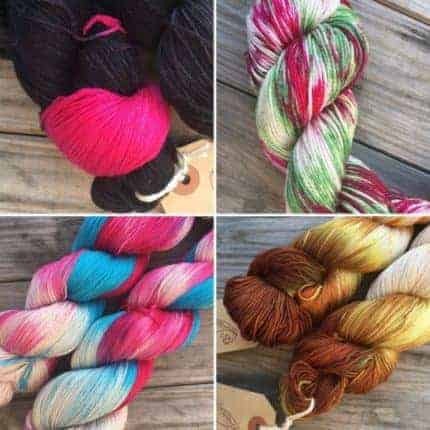 Smaller sets of five 75/25 merino nylon sock mini-skeins are also available for when you just need a little treat! When I was a little girl I was fascinated by stars and space. So far away, so strange! And amazing photographs of unimaginably distant galaxies continue to capture my imagination. Inspired by the beauty of space, “Distant Galaxies” is a semi solid variegated mix of black, purple, charcoal and violet. 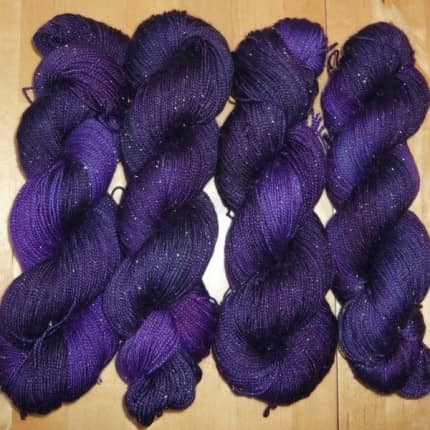 It’s currently available on sparkle sock that glitters like starlight, and a delightfully luxurious thread-weight Merino/silk blend. 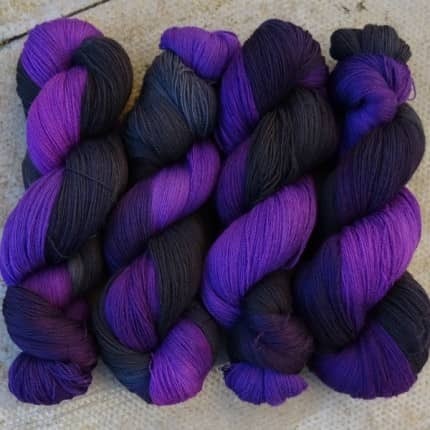 Further intergalactic adventures with this colourway on different yarn bases are planned over the next few weeks, so please ask if you are interested in seeing me stock a particular type or weight. 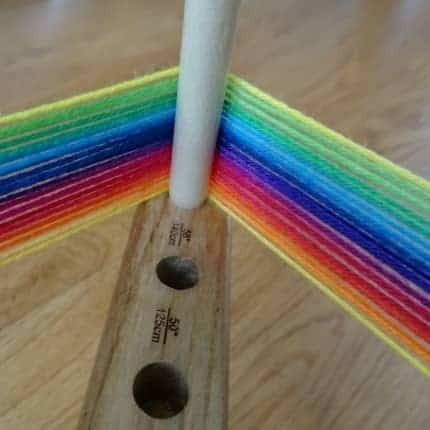 What could be more fun than a rainbow? 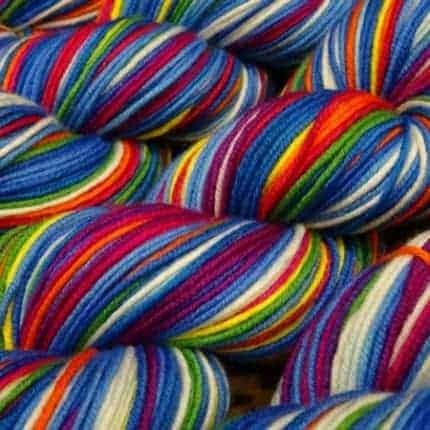 A self striping rainbow with variegated transitions between colours on delightfully soft and smooth sock yarn! 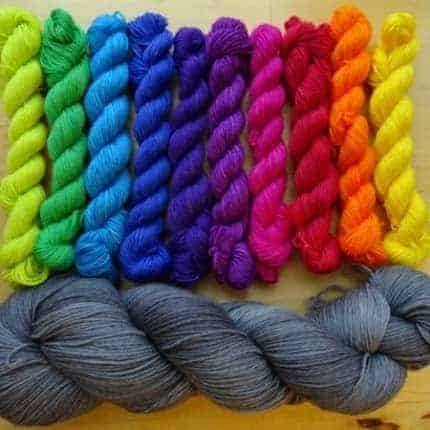 This colourway has a long repeat of around forty metres, so you would get five complete rainbows per sock if you used an entire skein for one pair. 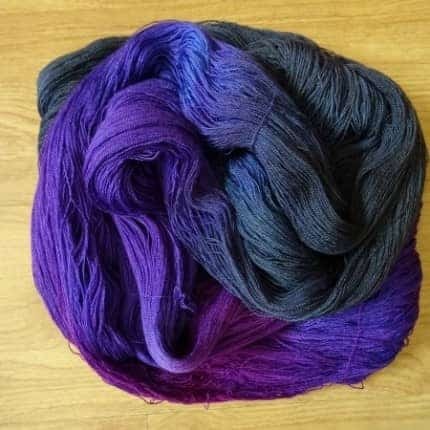 Shorter and longer repeat options are also available, and you can choose from high twist merino or merino/nylon blend. 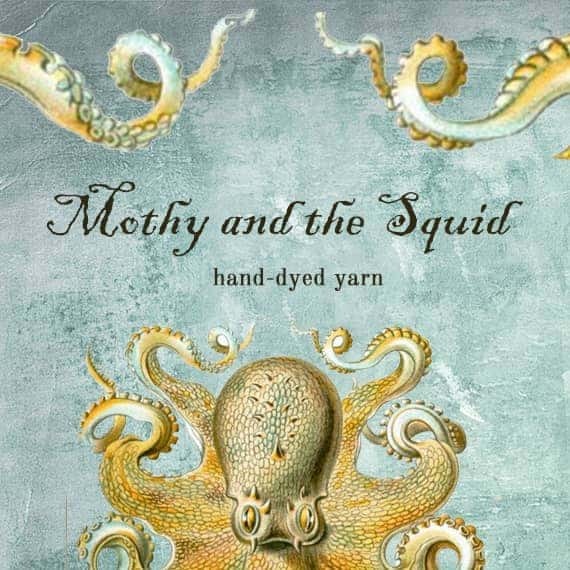 Inspired by cheerful brights, Mothy and the Squid offers happy colours on premium quality yarn. We specialise in self striping sock wool for your visual and tactile knitting pleasure! 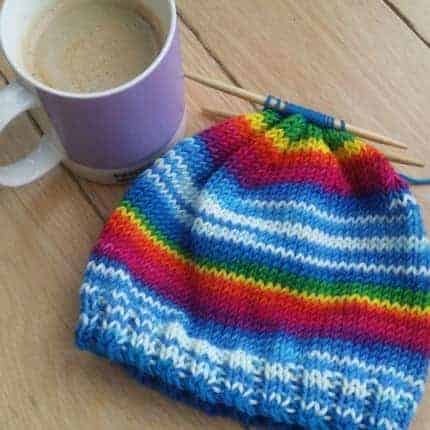 Our popular “Summer Skies Rainbow Brite” is now available on DK 100% Merino yarn for self-striping hats, as well as on Platinum Sock and Sparkle Sock. It’s a delight watch the “clouds” emerge from the blue “sky” as you knit, and the rainbows are super vibrant! This yarn is very even, for beautifully neat stitches, and has a wonderfully soft smooth handle for really snuggly finished objects. 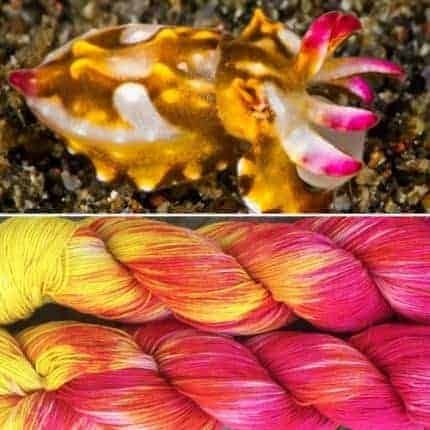 Mothy and the Squid specialises in bright self-striping rainbows on a selection of premium sock weight yarn bases. 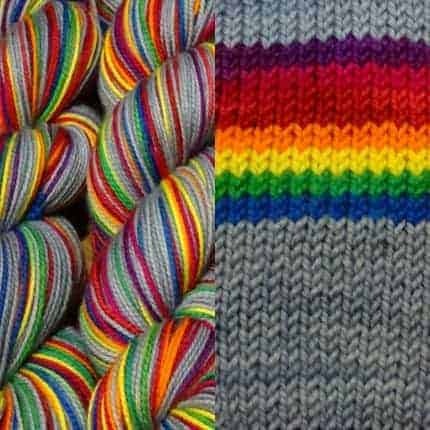 Pictured is “Grey Skies Rainbow Brite,” which self stripes beautifully on socks of all sizes. This colourway is available on 75/25 Merino/nylon Platinum Sock and snuggly soft 100% Merino High Twist Sock. 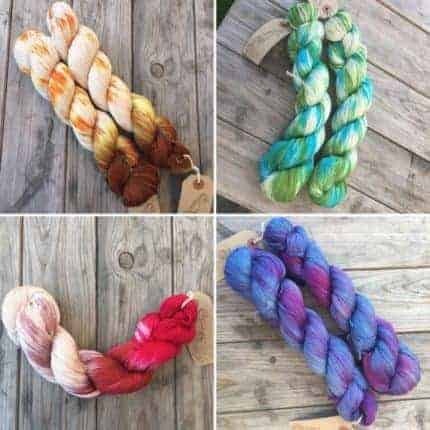 Variations on the theme include almost every background colour you could wish for — and if I don’t have it in stock I custom dye at no extra charge! 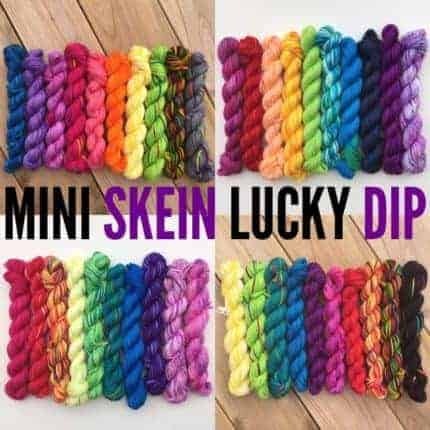 We have about a dozen rainbow miniskein options currently available in our shop. 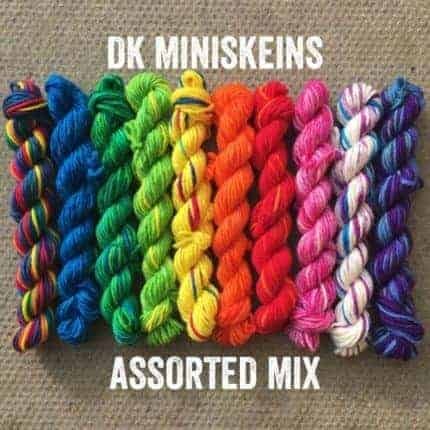 Most are sock weight but there are some colourful DK options too. 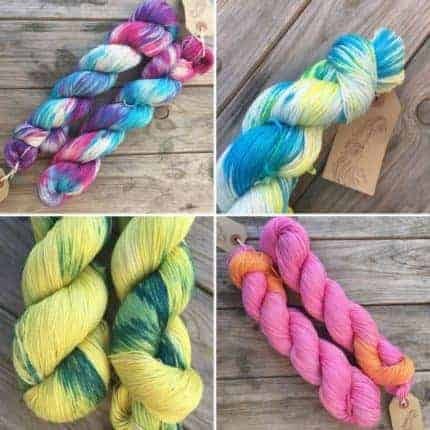 Pictured is the gift set of ten brightly coloured rainbow mini skeins of soft smooth sock yarn, each weighing approximately 10g (just over 100g of yarn in total) plus one full size (100g) skein of pretty grey on the same yarn base. 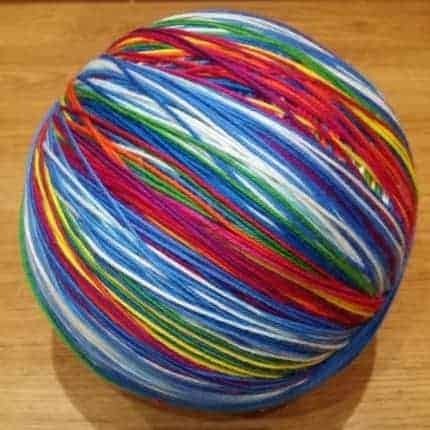 200g yarn in total. Plenty of yarn for full size adults socks and then some . . . or for adding bright colour to any project. Both the miniskeins and the grey are also sold separately. These are a superwash treated 4ply sock weight with 75% merino wool for softness and warmth and 25% nylon for strength and durability. It is suitable for approximately 2-3mm needles. 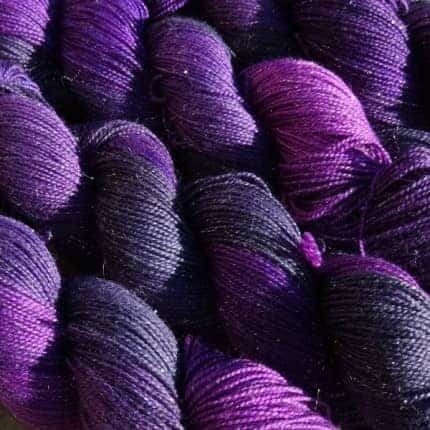 About 42 metres per 10g skein, or 420 metres per 100g, adding up to 200g (840 metres) total for the gift set pictured. 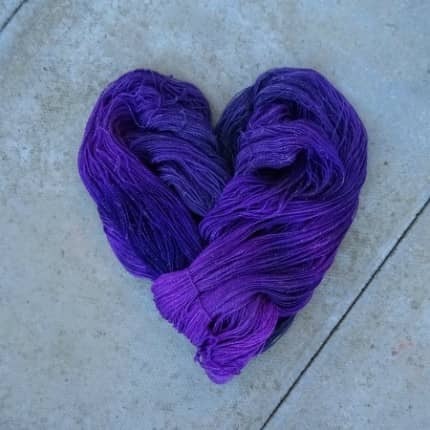 If you love a hand-dyed sock yarn then take a look in our shop as we have some beautiful original colourways hand dyed with love in our West of Scotland family home. 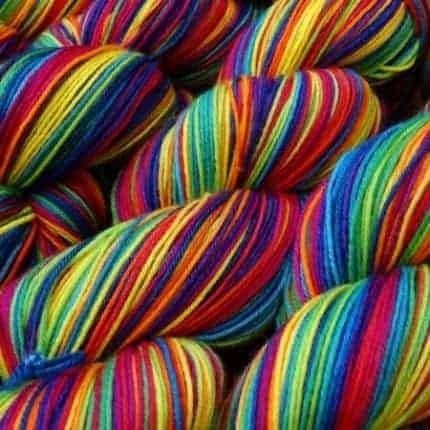 We specialise in rainbows, miniskeins and self striping yarn but also keep a large stock of other colourful designs. 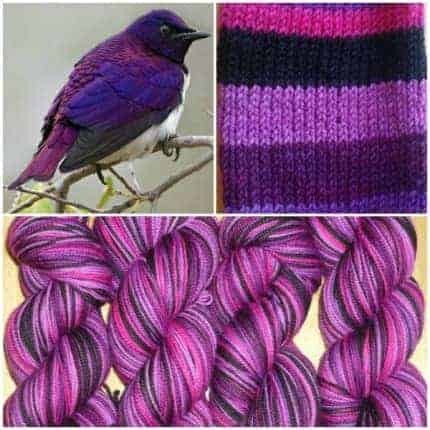 Inspired by the stunning natural beauty of the Violet Backed Starling, this sock yarn self stripes with a 20-metre repeat. It’s one of a series of birdlife yarns, including the Rainbow Lorikeet and Bird of Paradise. 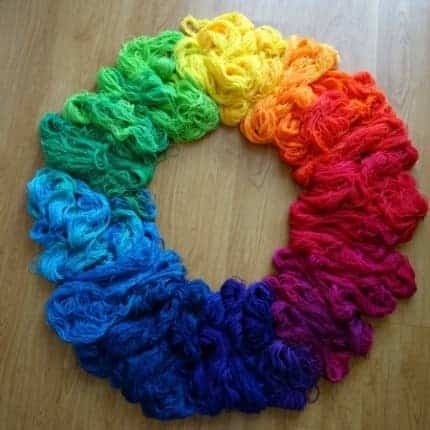 We also have a range of rainbow yarn, self-striping yarn, sock blanks and other unusual creations.